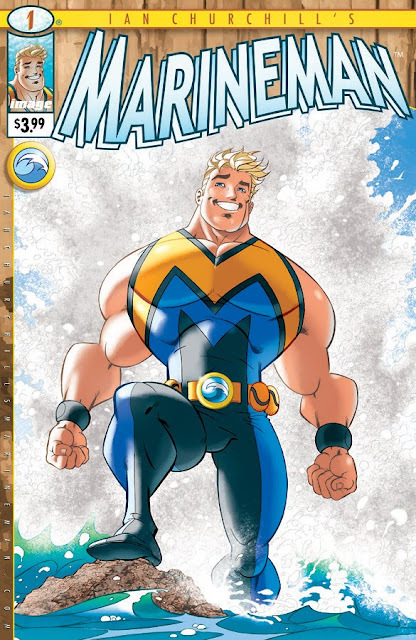 This December will see the release of an all-new series telling the story of a new oceanic hero, MARINEMAN, written and illustrated by Mr Ian Churchill (Elephantmen, Hulk, Supergirl, Uncanny X-Men). The folks at Image have been so kind as to supply us with the cover art for the upcoming first issue. Churchill explains, "When I created MARINEMAN over thirty years ago, I always dreamt that one day I would be lucky enough to write and draw comic books professionally and get the opportunity to bring MARINEMAN to as wide an audience as possible. Thanks to Image Comics, my dream is becoming a reality! I hope everyone takes the plunge and rides the wave with me!" The main protagonist and namesake of the series, Steve "MARINEMAN" Ocean, works as a marine biologist and TV presenter. This lucky SOB has the lot! The looks, the career and amazing friends (just like Jamie Durie) but ever-present is a deep dark secret which, if revealed, could change Steve's life forever.